Taapsee shared a picture with the world's oldest women sharpshooters, Chandro Tomar and her sister-in-law Prakashi Tomar, on whom the sports drama is based. Bringing out her upcoming movie from the lap of controversies and rumours, actress Taapsee Pannu, finally revealed that the shooting of her new film, Saand Ki Aankh, previously titled Womaniya, has officially gone on floors. 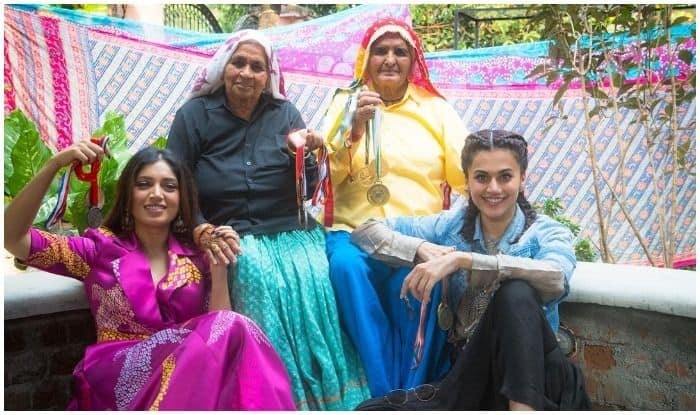 Taking to her Instagram account, Taapsee shared a picture with the world’s oldest women sharpshooters, Chandro Tomar and her sister-in-law Prakashi Tomar, on whom the sports drama is based. Sharing the vibrant picture, also featuring her co-star Bhumi Pednekar, Taapsee captioned it as, “Kabhi humaari picture shelve karva dete hai kabhi title ki maara maari, maine socha main Khud hi picture announce kar deti hu through my PERSONAL MEDIANET ab jisko jo ukhaadna hai ukhaad lo (Sometimes they shelve our movie, then there’s the hassle over the film’s title. I’ve decided I should just announce my film through my personal medianet. They can do what they want now.)! Kickstarting the shoot of our country’s oldest and coolest shooters #Chandro #Prakashi‬” (sic). Announcing the changed title name and with that pulling all stops to the rumours of the movie being shelved, Taapsee captioned another picture as, “यो रेहा टाईटल! क्यूँकि माने ना दिखती चिड़िया कि आँख, माने तो साँड की आँख दिखे है ! (Here is the title. Because I can’t see the bird’s eye, I only see the bull’s eye.) Proud to be a part of this journey which will bring to you the story of these women who fought all odds to change destiny ! #SaandKiAankh @tusharhiranandani @anuragkashyap10 @reliance.entertainment #NidhiParmar” (sic). The film marks writer Tushar Hiranandani’s debut as a director and will be jointly-produced by Anurag Kashyap and Nidhi Parmar.